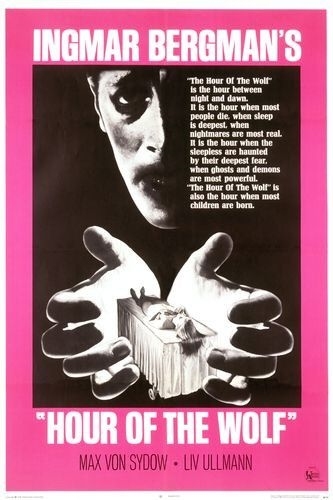 “Hour of the Wolf” was my first Bergman-movie, but I’m pretty sure that it won’t be my last. What’s most impressive about it are the visuals. Damn, something definitely can be said about good old-fashioned black & white cinematography. I’m a fan of this style, but I also have to say, as much as I like it when a new movie comes around that’s shot in black & white, it’s just not the same. The way Ingmar Bergman plays with shadows, the contrast between darkness and light, et cetera, is just stunning. They don’t make them like that anymore. Even though it’s more than 45 years old, it’s one of the most beautifully shot movies that I’ve seen in a while. Apart from that, I mostly liked certain scenes (especially the dialoges between Alma and Johan during the titular Hour(s) of the Wolf, as well as the gloriously surreal puppet theatre-scene), the incredible mood that Bergman builds during certain moments, and the performances by Max von Sydow and Liv Ullman. What I could have done without, though, is the extremely weird ending the movie progresses to. The scene at the cliff with the boy was already strange enough, but what happened at the castle near the end was just completely bonkers, and instead of drawing me in, it rather took me out of the movie (as a reminder: I usually prefer my movies a little bit more literal and down-to-earth). What I liked, however, was Alma’s fear that the craziness of her husband might rub off on her. That was a nice and interesting notion. Nevertheless, if I should ever decide to watch this one again, it will mostly be because of the stunning visuals, and less because of the plot. This entry was posted in cinema 2014, movie reviews and tagged black & white, Die Stunde des Wolfs, filmmuseum, horror, Hour of the Wolf, Ingmar Bergman, Sweden, Vargtimmen. Bookmark the permalink.